Have you ever considered a career in the gaming industry but don’t know where to get started? The United States gaming industry generated revenues of roughly 19.9 billion, in 2016. The worldwide market is projected to grow from an estimated 1.72 trillion dollars to 2.14 trillion in the next five years. With professional esports gamers banking an average salary of around $97,00 you can tell your mom that gaming is an excellent and viable career choice for you. Danny “fRoD” Montaner – Pro gamer for over 10 years, winner of multiple world championships, esports player of the year in 2005, North American counter strike player of the decade, considered one of the best AWP’s (snipers) in Counter-Strike history with the best statistics, and franchise player on DirecTV’s championship gaming series. Fu Shark – Fu has over eight years experience as a freelance digital artist with focus in illustration and animation. He is currently Creative Director for Game Trep, an organization devoted to the growth of the local gaming ecosystem in South Florida. Pedro Guerra – Pedro is the founder of Miami based independent game development company Good War Games. Good War Games produces 2D style PC games, mobile games, and virtual reality games. While not making games, Pedro is a strong voice in the Miami game development community helping establish several game development communities such as Make Games Miami and Unreal Florida. Alex Batista – FIU End Point Technician by day, gameplay programmer at Good War Games by night. Alex is a self-taught programmer with language concentrations of C++ and Python. Alex has built a wide range of games including Wasabi Demo, Hyperbae, Gacu-Brawl Demo and is currently working on an unannounced project. Myron Mortakis – Myron Mortakis is the president and founder of HELM Systems, LLC. a South Florida interactive entertainment and VR development company. Myron has been actively engaged in game and interactive software development for more than 16 years, fulfilling a wide range of roles including project and production lead, business development, project planning and pre-production, game and level design, 2d, 3d and technical art production, programming and visual scripting, animation and sound design. Under Myron’s leadership HELM Systems has been developing its primary IP “The SoulKeeper” which has received several recognitions through the years, including an IGF 2006 Award nomination, reception of a prestigious Unreal Dev Grant from Epic Games and international press coverage by mainstream online and print media outlets. 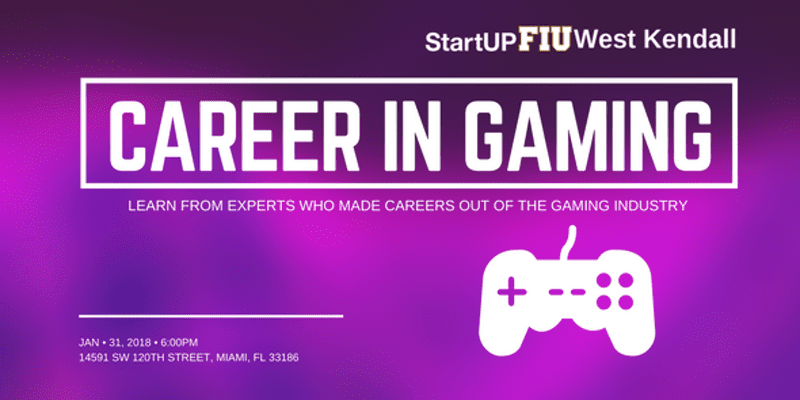 Gaming is one of StartUP FIU WEST KENDALL’s core pillars for its role in the 4th Industrial Revolution. As an industry, gaming continues to change the way in which we learn, interact and play. Professional gaming’s rapid growth over the last 20 years has drawn a lot of attention and began to legitimize the industry. By 2020, the ESports Industry is expected to be valued at $1.5 billion. In 2016, there were 4,122 tournaments with total prize money equivalent to $95.3 million and the top pro players made salaries of over $300K. The gaming industry is increasingly gaining a role in our society, especially when combined with disruptive technologies such as Virtual Reality and Augmented Reality. The gaming industry is an evolving industry that will continue to impact our lives. Working within the gaming industry encompasses game design, software developing, amination, professional gaming and much more. The industry, therefore, demands a variety of individuals with different core skill sets and expertise. Our goal at StartUP FIU WEST KENDALL is to give the South Florida community the knowledge and skills to enter the gaming industry. What is StartUP FIU West Kendall? StartUP FIU West Kendall is committed to the learning, developing, and testing of emerging technologies. Open to the community; we will host workshops, hold events and have co-working space free of charge. We aim to foster the tech community and create more opportunity within tech in Miami emphasizing our four pillars: Artificial Intelligence, Virtual Reality, Gaming, and Robotics. StartUP FIU is an initiative developing innovation and entrepreneurship to fully leverage the Fourth Industrial Revolution for FIU and the Miami community. Glad you asked. Emerging Technologies are technologies that have the perceived capability of substantially altering the business and social environment. According to the World Economic Forum, we are currently in the Fourth Industrial Revolution, a “period of change driven by unprecedented technological development.” Emerging technologies such as Artificial Intelligence, Virtual Reality, Autonomous Cars, Blockchain, 3D Printing, and Biotechnology will have a significant and unprecedented impact on society as we know it. 78% of West Kendall residents commute to work outside of the community. With a population of roughly 40,000 workers living in West Kendall, that’s around 31,000 people driving across Miami every day. We want to fix that problem by fostering an innovative tech community to eventually bring high-paying jobs back to West Kendall, making your commute a little more bearable. Who is in our space? Alienware – a computer hardware company specializing in gaming. Topp Solutions – a certified repair facility servicing manufacturers, insurance providers, and mobile network operators. Life Wallet – provides a powerful solution to assess and monitor the health of their population. Dell – multinational computer technology company. You – Lastly we want YOU, the community to use our space and learn, grow and develop with us. Got any questions, concerns or fresh ideas? Email us at startupWK@fiu.edu!! We would love to hear from you!